You probably heard of Chotto Matte in London, but this homeboy has absolutely no relations to the Japanese-Peruvian restaurant of the same name. 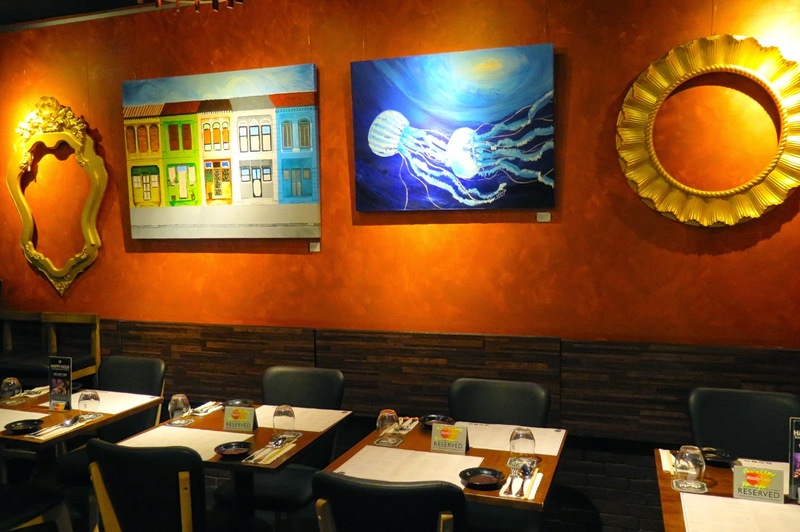 Located at a quiet corner of the residential shophouses of Blair Road, Chotto Matte is one of the few Japanese restaurants in Kampong Bahru that is worth checking out. This Japanese restaurant Chotto Matte, which means “wait a moment” takes up a semi-casual ambience in both sushi-bar and bar-bistro concept, showcasing an enticing menu of quality yakitori specialities, sushi and sashimi. 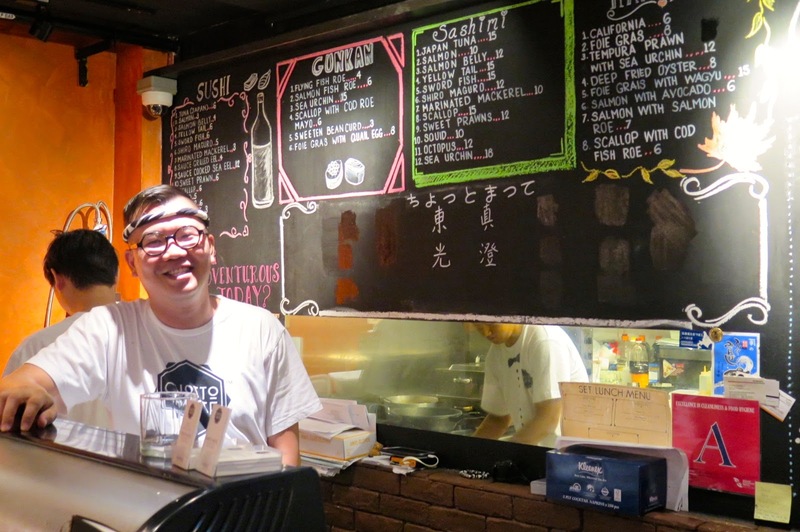 Chotto Matte is the latest venture of Mr Jeff Ong whom backs Torii, one of Kuala Lumpur’s most buzz-worthy Japanese restaurant which is also an after-work crowd favourite. 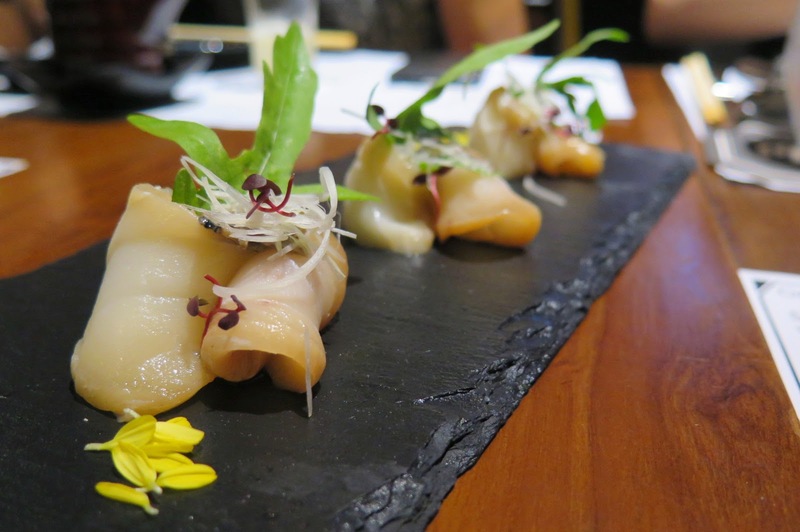 The home team melds the best of casual Japanese dining with a classic Singapore locale, focusing on bringing the most exquisite Yakitori, Sushi and Sashimi experience to its patrons. At Chotto Matte, customers can look forward to indulging in a mouth-watering menu selection of grilled specialities, as well as skilfully-prepared pristine sushi and sashimi, and inspired modern renditions by Chef Roy Chee, previously Executive Head Chef at Standing Sushi Bar and his team. 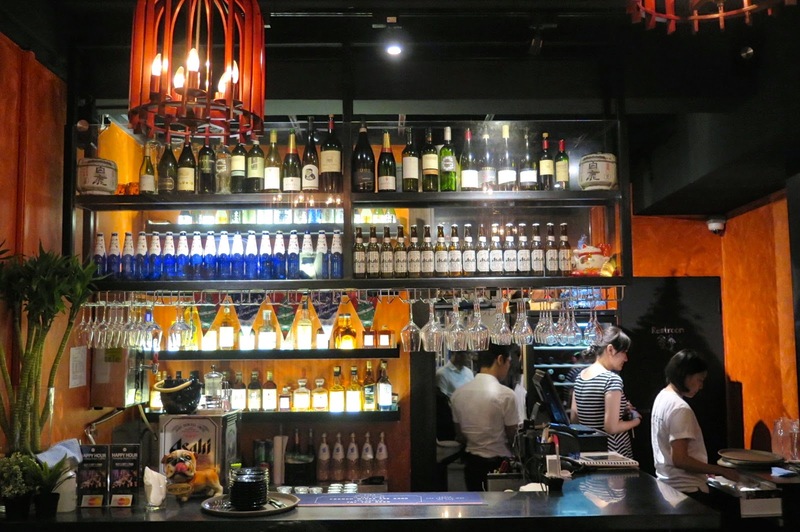 Complementing the menu, customers can enjoy a thoughtfully-crafted list of artisan cocktails, Japanese whisky, sake and other tipple line up from the bar. Chotto Matte offers three dining spaces – a main dining room, an outdoor seating area, and a sake and sushi bar where you can pay close attention to the menu chalkboard on what to order from the meticulously sourced seafood imports around the world, or else just ask Chef Chee for his special recommendations, and he will usually tell you to go for the Omasake offer which is priced comfortably at just $100 and you can make a meal of it. The a la carte menu at Chotto Matte comprises an extensive variety of typical Japanese fare and inspired contemporary dishes from salads, soups, rice bowls and sushi, to the restaurant’s sea salt yakitori items which are grilled over Binchotan, the traditional white charcoal of Japan to lend that distinctive smoky flavour. Here are some highlights of the main menu that’s served at both the sushi bar and the bistro-bar. 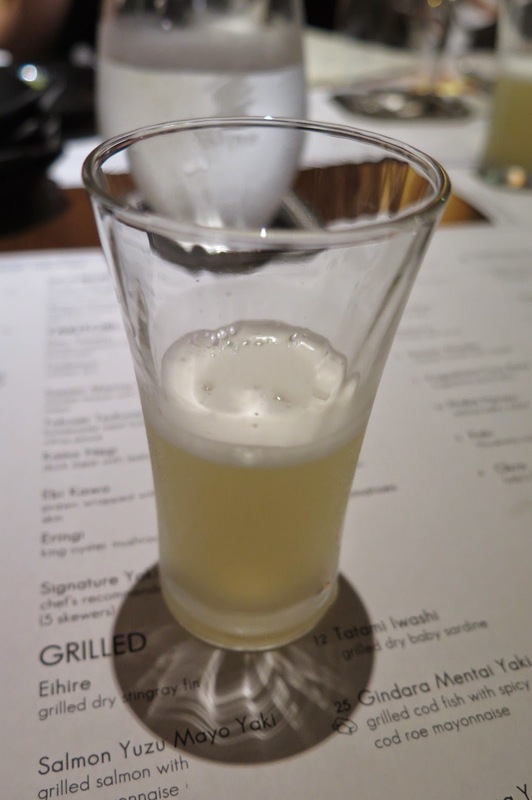 To get you started, you can snack on some Edamame and sip on the Chotto Matte, the restaurant’s namesake concoction with citrus-flavoured sake Umenoyado Yuzu Shu, Yamazaki 12 and egg white to give the cocktail a light frothiness. The sashimi at Chotto Matte were remarkably sliced and pleasantly fresh, succulent and sweet. That little green hand grenade, the wasabi was freshly grated by hand so that you don’t really get that overpowering characteristic when eating. Bet you didn’t know that. 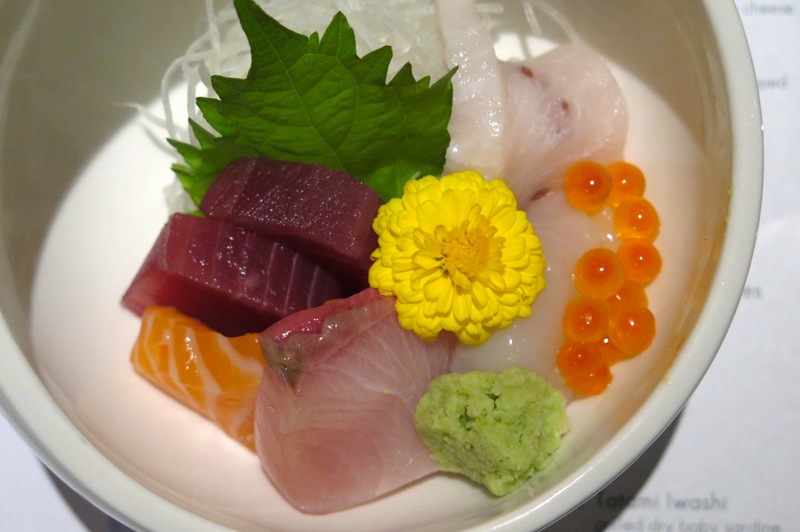 Do also note that the seafood items on the sashimi platter may change according to season. 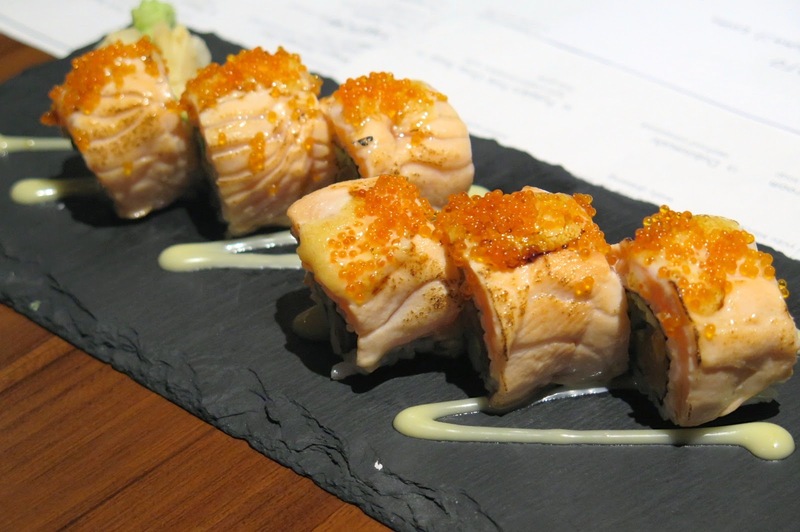 Aburi Salmon Maki, easily the most popular dish to eat at Japanese restaurants, unfortunately this one was one of them that didn’t manage to impress me. 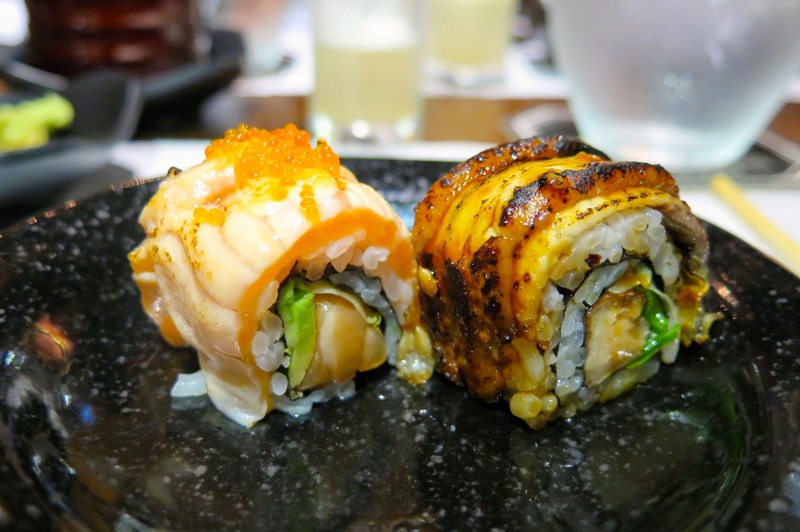 Maybe I am biased, or was just distracted as I was thinking about the mind-blowing Aburi rolls at The Sushi Bar and the legendary Shiok Maki at Koh Grill. I found that the flavours here are less pronounced and I like the texture of the rolls to be slightly more chewy. Stars with strong personality can sometimes clash and its the best to keep them apart. 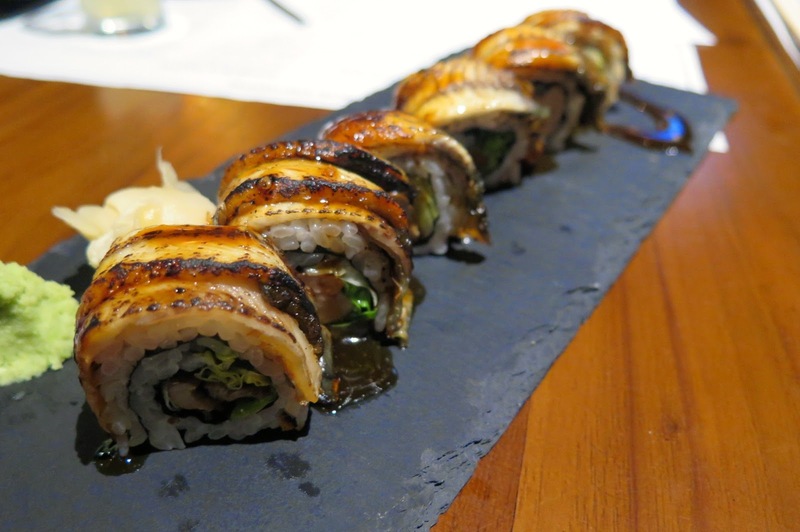 Not happening this time, as the pan seared Foie gras and Unagi eel roll achieved an exquisite harmony of their balanced component flavours and texture. These mouth watering morsels are absolutely a must-try! 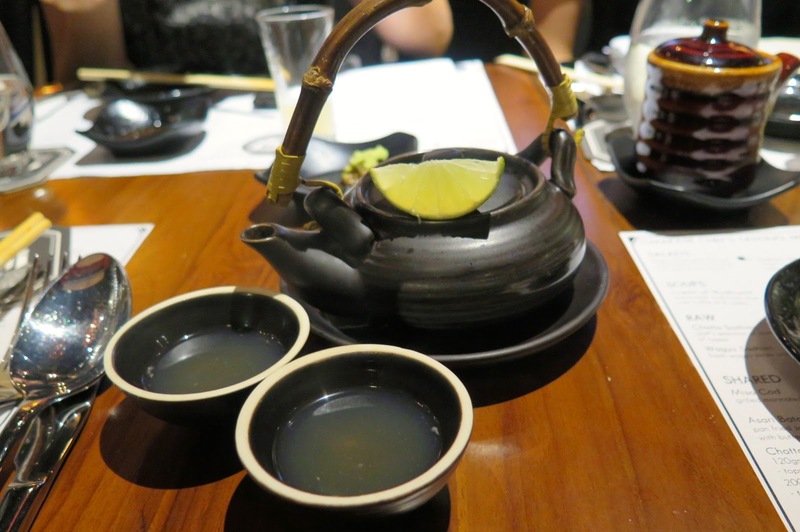 A traditional seafood broth steamed and served in a teapot. This elegant dish may look simple and dull in appearance, but the intricate flavours of the broth will be highlighted when you sip it. The broth has been well prepared, there’s really no need for the fresh lime wedge. The thin silvers of Albacore tuna gave us an outstanding taste experience, it made us thought that we were not eating a fish. As compared to yellowfin tuna or amberjack, this white meat tuna has a mild flavour and solid with a meaty texture. 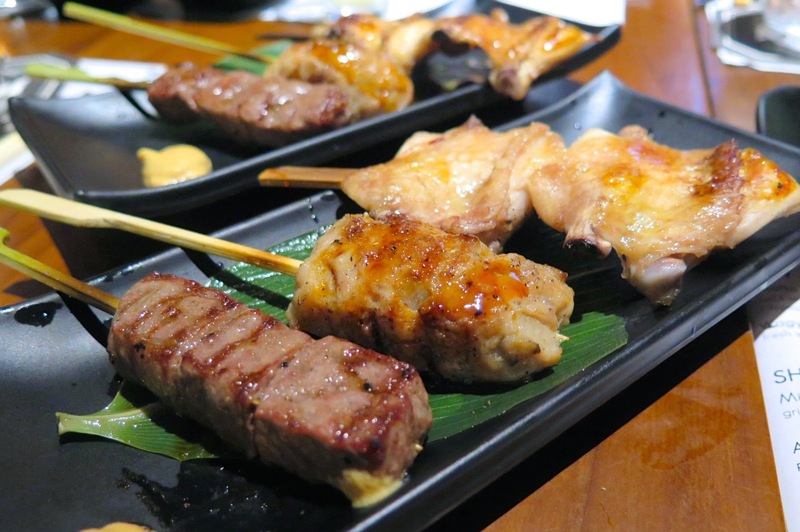 Skewer up some delicious grilled meats and down some cold sake or beer is exactly what’s needed after a long day in the office. You can go for the signature yakitori platter ($19) consisting five skewers or pick your favourite from the a la carte menu. We had the usual suspects which were wagyu beef, chicken meatballs and chicken wings. The succulent meats were well-seasoned and grilled to perfection over the special charcoal imported from Japan. 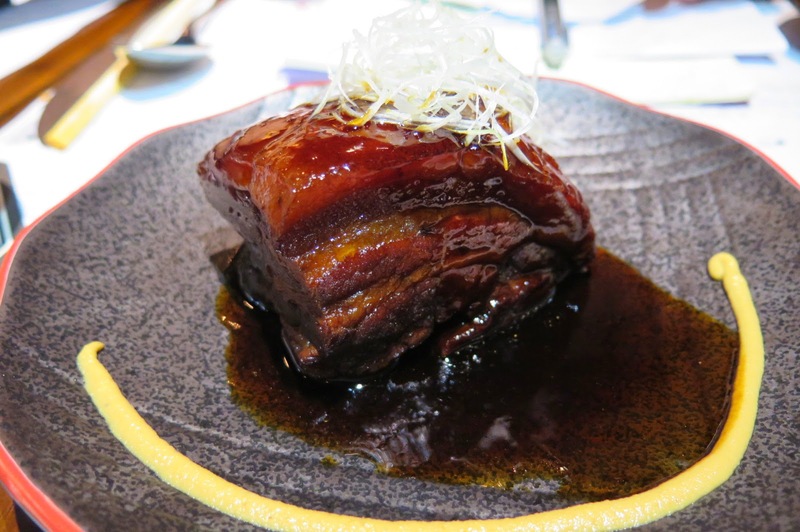 The tender, juicy chunk of pork belly has been braised for hours until tender and glazed in a sweet sauce reduction of mirin, sake and ginger. Sometimes it can be hard to resist to the appeal of rich, mouth-watering food that makes you feel deliciously guilty. This Buta Kakuni is one of those guilty pleasures that’s definitely worth it. 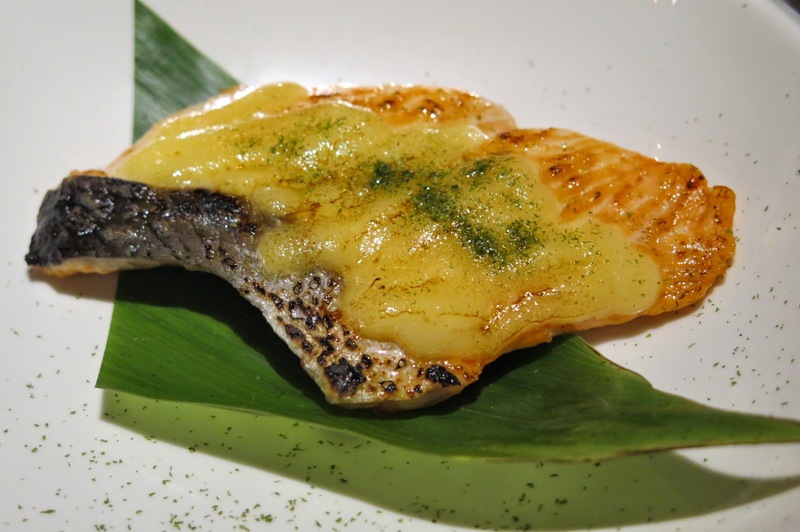 This grilled salmon has its skin on and topped with Chef Chee’s homemade yuzu mayonnaise. The sweet and tangy mayo goes perfectly well with the salmon, keeping it moist and brings out a refreshing element to the dish; a must try for fish lovers. 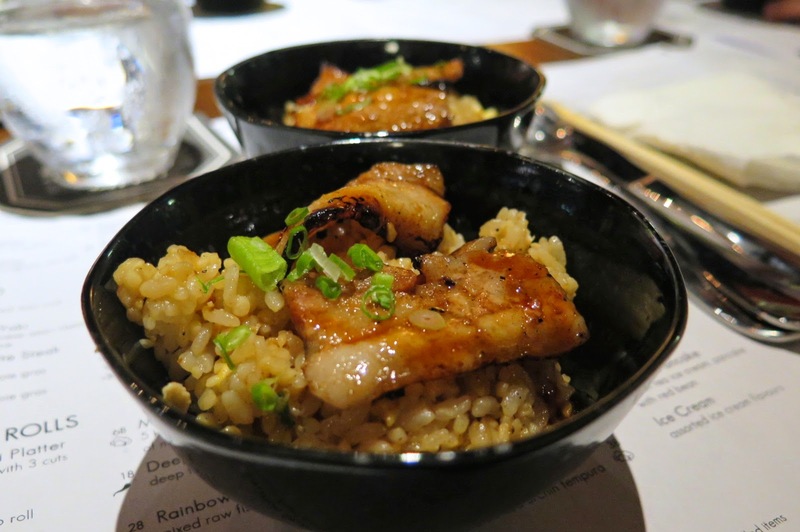 The highlight of this dish was not the pork belly, but the fried garlic rice. The rice has been washed and cooked with water filtered through a Japanese-imported system which enhances the innate sweetness of the grain, then fried with impossibly pungent garlic to achieve that smoke-filled aroma where most people called it “wok hei”. You won’t be disappointed. Desserts were a simple affair, they are usually Japanese Ice Cream and they all taste wonderful. 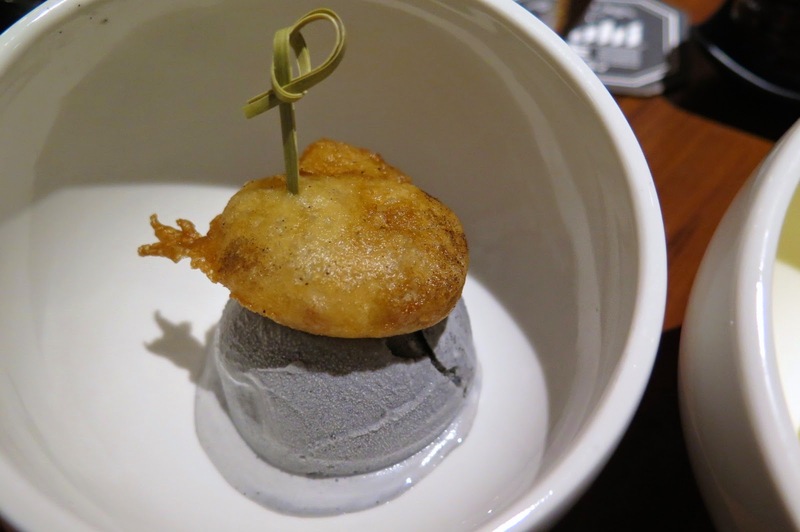 The black sesame ice cream and the deep fried yam makes the perfect cap to a lovely meal. The black sesame ice cream was not too sweet, the Japanese yam was fried till crisp and mild in flavour. You should find joy in life with a piece of perfectly fried dessert. 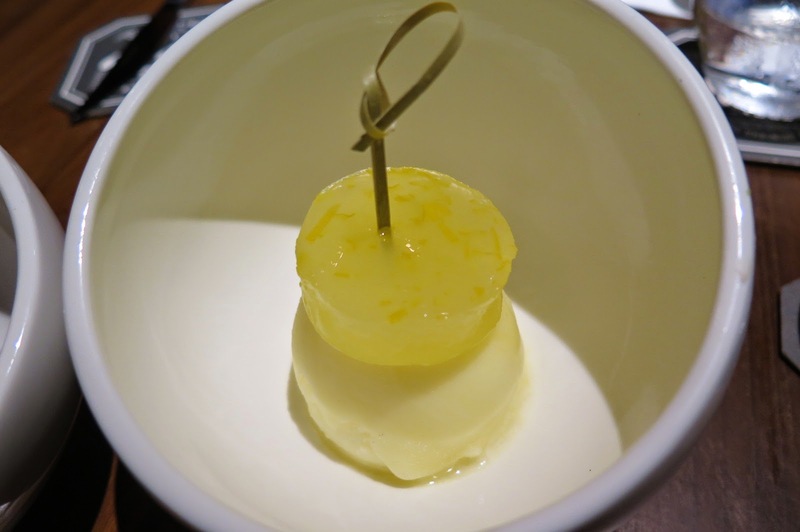 Yuzu lovers should go for the Yuzu sorbet and jelly dessert, as it is refreshing and bursting with aromatic citrus flavour. It lets you celebrate your sweet tooth without feeling any of the guilt.